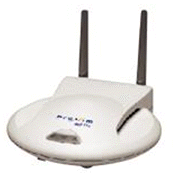 Wireless access points or wireless routers come in many different shapes. There are many parameters besides the color of the box, such as external versus internal antenna, firewalls, ports, encryption, output strength, receiver sensitivity, and others. Wireless access points differ also in the level of built-in security features and bandwidths (standards) that they support. The following text does not provide a complete "cookbook" to wireless routers, but is should provide at least a solid starting point. When buying a wireless router, the decision process is often more complicated than just choosing the most-powerful and most-expensive router. A "more powerful" does not always mean "better." In general, more powerful or multiple wireless access points are necessary to network large buildings with concrete walls, while less powerful access points are needed in small buildings with a few open offices. Now, let's take a look at the details. There are limitations to radio waves. Radio waves can be reflected by some materials. Radio waves can also be absorbed by many materials such as water, plastic, sheetrock, and carpeting. When designing your wireless network layout, it is important to consider both reflection and absorption. Furthermore, radio waves (like light waves) get weaker as they expand outward away from their source. The signal unavoidably weakens as it propagates outward from the source (this is called path loss). This loss grows as the square of the distance. This means that if a device is moved twice as far away, the signal power drops by one fourth. The greater the distance from the client to the access point, the poorer the signal and the slower the connection. Because of these limitations, large offices often deploy several access points with overlapping ranges. Common range of wireless access points is, depending on the standard used and on many environmental variables, up to 180 feet (55 m) indoor and 1500 feet (450 m) in an open space. Modern buildings made out of reinforced concrete are known to limit wireless signal to as little as 30-40 feet (10-15 m), so it really does matter a lot where your wireless network is located. When configuring your wireless network, you may need multiple wireless routers instead of a very powerful one. This is especially vital if you also need to control your security. While one very powerful wireless router may provide enough signal for your office, it may also provide enough signal to anyone on the street outside your building. Therefore, it might be better to consider a number of less-powerful wireless routers which are placed around your building in a way that your range of signal copies the perimeter of your building or office space. There are four basic standards which provide framework for wireless communication. The most common current standard for wireless networking, the IEEE 802.11g, offers 54 Mbit / sec connectivity. The 802.11n standard offers 100 Mbit / sec. The IEEE 802.11b offers 11 Mbit / sec connectivity. The 802.11a offers 54 Mbit / sec speed. However, for example, the 54 Mbit / sec speed at 802.11a standard is not necessarily more advantageous than 11 Mbit / sec under the 802.11b standard because the radio frequency (which determines how far the signal can go through walls) also plays an important role in wireless networking besides the network bandwidth. In situations when a true 100-megabit or a gigabit of net badwidth connectivity is necessary, the physical wired network with Cat5, Cat6, or fiber-optic cabling might be the only possible solution. The more users will be connected to the wireless network, the more bandwidth is required at the wireless access point or wireless router. High-end wireless access points support speeds of 11 M bit / sec under the 802.11b standard and 54 M bit / sec under the 802.11a and 802.11g standards; therefore, such access points will be sufficient for tens of users. Multiple access points will be more likely required to serve hundreds of users. In case you need to support hundreds of users, you will either need a large number of access points or perhaps upgrading to the 802.11n which operates at 100 Mbit / sec (note, 100 Mbit / sec translates to about 1/2 of net throughput after deducting communication overhead). If a received signal is made up of radio waves from the same signal that has dispersed and arrived from different paths, i. e. some of the original waves were reflected off some object before arriving at the receiver, then the effects of multipath are seen. Television sets connected to antennas often exhibit this as ghosting. Network users may likewise experience its digital counterpart - referred to as intersymbol interference. This is caused when the difference in time between radio waves arriving from the same signal, referred to as delay spread, is enough to cause symbol overlap in the digital data. As the data transmission speed gets faster, the time between received data bits get smaller and more susceptible to intersymbol interference. Wireless access points or wireless routers differ in the ability to spot the delay spread and eliminate the intersymbol interference. The more intelligent wireless access point hardware should be characterized with the ability to weed out smaller delay-spread times. The receiver-sensitivity characteristic contributes to the reliability of transmitted data. The more sensitive the receiver, the more reliable the connection will be. Each access point in the market supporting the IEEE 802.1x standard ought to be equipped with some encryption software. The less sophisticated and cheaper access points have only the WEP; the more intelligent or newer access points include some flavor of WPA encryption. To improve your network security, you should also expect the wireless access point to provide features of MAC addressing and VPN security software. Most wireless routers on the market today also provide some firewall software. Most wireless routers provide connection to 10/100 MB/1 GB Ethernet LANs. The cheaper ones connect to the Ethernet over regular twisted-pair cable. The more expensive wireless access points support multiple connections to the Ethernet wired network over Cat-5 cabling. Some wireless access points support Power-over-Ethernet. The more expensive WAPs come with a built in router, DHCP (Dynamic Host Control Protocol), and DNS (Domain Name Service) support. The quality of hardware is often backed with multiple-years warranty and a 24/7 technical support. Some wireless routers support multiple standards (802.11a, 802.11b, 802.11g, 802.11n) at the same time (in the same session).